Udo Noll was born 1966 in Hadamar/ Germany, he lives in Berlin and Cologne. He graduated as applied scientist for film, photography and media technology at the university of Cologne. Since then he works as an artist and media professional in numerous international projects and exhibitions. He’s also the founder of radio aporee, an open and collaborative platform for the research about sound, art and space in today’s mixed realities. involved into the scene of net art. From that time, techniques like mapping come from. The sound mapping of today is a present-day application. What happens when real rooms interfere with media spaces? The whole modern terminology of cyber space, browser and navigator is a result of these space related metaphors. I am less interested in architecture as such but more in spaces of living. Coming from that point, I developed the idea of radio aporee, where space and sound interact. Is radio aporee a radio station as we know it from the past? I am just re-inventing radio! (laughs…) But all the big Broadcast Corporations try to rescue or to re-invent the medium at the moment. I am interested in radio since my childhood. On the old radio sets you could find the big scales and names of cities and stations from all over the world. The relation of sound and space is evident on old radio receivers. When you turned the wheel you traveled through a big sound map. Radio combines space, sound and its changes by linear movement. It’s still there and works to date, e.g. when you switch on a world receiver. The sound of short waves are related to the cosmic weather, you can hear solar activity modulating the outer atmosphere. Radio is spherical music. Does radio aporee transform this idea into the digital world? It has its roots there but it is not a translation. Maps have their own language. For people, maps are the first experience of space beyond their own reach. Radio opens far away spaces as maps open imaginary landscapes. I am occupied with the idea of streaming and online radio since more than 10 years. Radio aporee establishes an imaginary relationship to a certain location: If you click on a recording, you hear with the ears of someone else. At the moment, there are about 13.000 recordings available and the number grows every day. The project radio aporee ::: maps works with a very simple interface. Everybody can register via his e-mail- address. You just decide whether you like to load your recording via a Creative Commons license or a public domain and assign it to a certain location. The sounds should be pure field recordings, but no mixes or music. The crucial idea of the whole project for me is geographical imagination. Today, we are living in multi-layered spaces and this changes our perception of space. When radio telephony was invented at the beginning of 20th century, it changed everything. Since then, we are in contact with each other, everywhere and all the time. When I started radio aporee in 2005, I used google maps at first because it simply was available, offered a quite comfortable interface and its visual pattern, satellite imaginery etc. were already well known. But of course, google maps is a private company with its own interests and their maps do not depict the world as it is. Doing mappings has always had an authoritarian aspect. This is why nowadays radio aporee offers to use open street map as an alternative to google maps. The recordings are property of radio aporee resp. the author, anyway. Nothing is stored on Google’s servers. Radio aporee brings sounds of far away spaces close. What, do you think, sounds in these spaces? Do spaces really have a sound of themselves or do they only give us an echo of what we like to hear in them? “Authentic” and “natural” are terms that are questionable, indeed. As soon as we use a microphone we are dealing with a technically mediated sound and a quantified reality. I am not looking for a pure or authentic sound but how somebody gets in contact with a space. This search and its details are the most interesting part for me. By the years, radio aporee has shown me so many different approaches of that search done by myself as well as by colleagues of mine. How has this work changed your own dealing with field recordings? When I am listening to something, it gets more and more important to me to focus on the precise listening situation and to do that as unreflecting as possible. A map does offer approaches for a geographical imagination but the better and more precise location happens by association. In the past, I was interested in sound constellations but nowadays I like to leave the sounds as they are. Instead of changing them I prefer to change the location of the microphone or my own position in a room. Recordings usually loose the intensity by post production when listened to via the map interface. In the meantime, radio aporee has brought many colleagues together. One is working of someone others material in versatile configurations and collaborations. 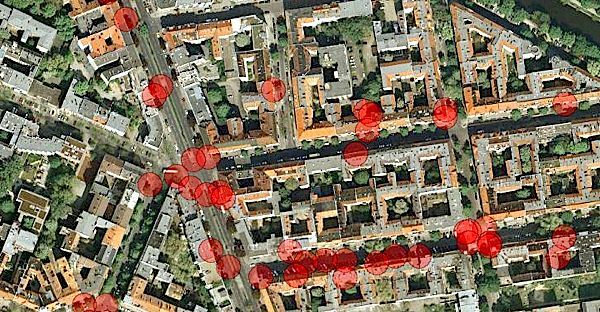 Since about 2007, many mobile phones have GPS built-in, which makes these devices location-aware. 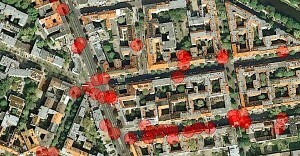 At the same time, the density of recordings on the sound map became quite high in some areas of Berlin. So I started to experiment with the mobile phone as a kind of radio receiver for these sounds in public space, right at the place where they are located and recorded. After a presentation of these experiments at the TUNED CITY festival 2008, I got in contact with Deutschlandradio Kultur. We then started a collaboration on a series of radio plays, called „Radioortung“, which was based on the radio aporee platform and mobile phone app. Performance collectives and radio artists like LIGNA, Rimini Protokoll and Hofmann&Lindholm have developed scripts for that. In fact, the mobile phone becomes a radio set for pieces in between sound art and poetry, documentary and radio drama, to be heard while you walk in your surroundings. Do you think, radio aporee works also an an archive? It does so, automatically. I have recently done recordings together with Peter Cusack, in a huge opencast mining, western Cologne. On maps, there are still villages but in reality, the villages are destroyed and the people are resettled. Our recordings make this destruction evident by the drone of the huge excavator and the obvious silence in the left villages. I would like to find out whether there is something like a “sound of energy” that would make it possible to hear the whole process. The life in the still existing villages has come to a standstill, since long. We’ve tried to capture this in an auditive way. On radio aporee one can successively stack recordings at a given location. From that, the method was developed to repeat recordings of the same place during a certain time span to represent the changes. Today, for example, thanks to long time contributor Henrik Schröder, you can hear how gentrification works in a quarter like Berlin-Neukölln: A Saturday night sounds different today, than it did 3 years ago. Yes, the radio aporee stream is 24hours daily available and works with the recordings from the radio aporee maps site via random selection. Just now, I try to modify the whole setting into something interactive. The aim is that radio and listener really interact with each other without pushing buttons and moving sliders but rather by the listener’s presence. When a listener uses the radio aporee app, the radio identifies his coordinates and shifts the playlist of the radio programme towards that activity. Mobile phones with an internet access are moving radio sets and they work multi-sensorical. That offers a great potential for interfaces and I am interested in how this can be used beside advertisement. The multilayered spaces of today offer new spaces for creativity. An online radio stream like radio aporee offers new possibilities of listening. Standing on a certain point in a city e.g. I can hear field recordings of that place as well as radio plays and sound works explicitly made for that location. That means, I may be the conductor of my own radio program, though it is still radio in the sense of a shared, or common listening. And if I like, I leave my own footsteps on the website whilst I am walking. Then, others can use this again as a material for their own dealing with recordings. I like the idea, that everyone can work with different materials and perspectives so that a more complex listening situation evolves. Everything from sound walks, narratives and radio plays to complete dislocation of soundscapes is possible. The platform is open for artists, individuals and organisations. This year, I’ve produced a piece in Tartu, Estonia, together with sound artist Patrick McGinley, and another sonic documentary was created by a group of students from the public history department of the University of Berlin. In the future, radio programmes focused on a certain topic as well as location could be generated by using field recordings and the practice of approaching places by sound. This takes up the old idea around radio and space from the beginning. With radio aporee I would like to develop this old idea further and transform it into something moving.